SHIPMAN: Juan confirms that it was Mrs. Sotomayor who encouraged them both to excel and dream, filling the house with barely affordable encyclopedias. And, yes, Nancy Drew. But young Sonia had a less-than-serious side. SOTOMAYOR: She loved comic books. And she loved reading Archie, and Casper and Richie Rich. But as a child, Sotomayor clearly benefited from an extended family that drove her to succeed. After her father’s death, her paternal aunts and grandmother convened an emergency meeting with her mother. 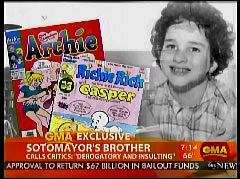 They had noticed that Sotomayor was devoted to Archie, Casper and Richie Rich comic books, and they were afraid these comics were distracting her from her studies. Where's A&E when you need them? We've got an intervention a-brewing! For goodness' sake, somebody GET THOSE COMIC BOOKS AWAY FROM THAT KID! You remember those Hostess ads in the back of comic books, don't you? The ones with Thor bashing people with his hammer to stop them from stealing Twinkies and the like? Well, Gone and Forgotten has a classic, incomprehensible one featuring Wonder Woman and the search for the Maltese Cupcake. • Is she trying to stop crime, recover a stolen artifact, or just helping an antiques collector source a particular item? Wonder Woman, personal shopper? • An arch-villain tricks her into coming to a bad part of town, corners her, and then—tells her to promise to stop looking for the cupcake.